Springfield Woods in Northeast Baltimore is the most modest of wilderness zones. Occupying just 3.27 acres south of East 43rd Street and west of The Alameda, it’s easy to miss. But look closely and you can find what Tim Nohe calls “a treasure house” of information there about the natural, cultural and industrial history of this part of the city. Nohe, a visual artist and UMBC professor, has been looking closely. 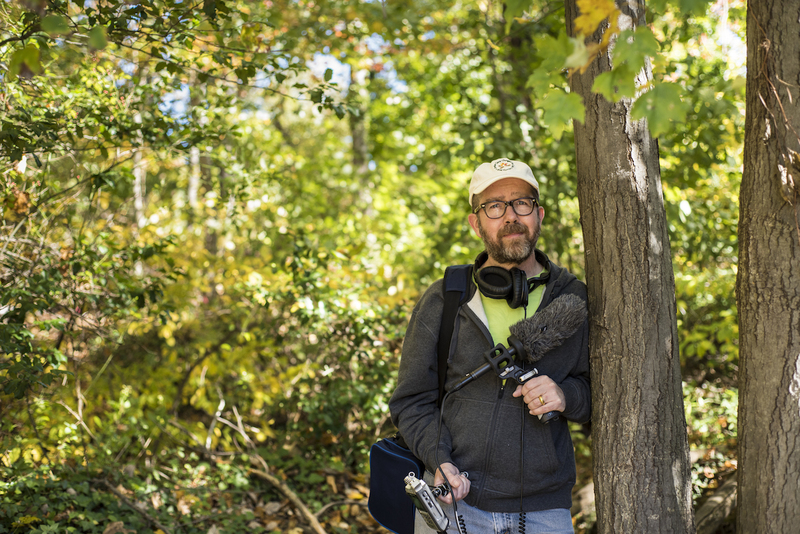 He and UMBC geography professor Matthew Baker are “geo-tagging” Springfield Woods – using GPS technology to create a highly precise inventory of the forest’s features. The information will be placed in a database and made accessible online to anyone with a computer or smartphone. Nohe foresees countless possible ways to use that information, from a visitor identifying a bird’s song, to a neighborhood group learning how to take care of trees, to local children studying the history of their community. Nohe points out that Springfield Woods improves the quality of residents’ lives by providing an oasis of quiet, shade, wildlife habitat and a beautiful, relaxing space. Geo-tagging reveals the park’s resources on a deeper level, allowing people “to see something that’s not visible” – for example, by making it easier to study the park’s soil composition and the presence of invasive species. Other things that are not necessarily apparent on the surface but very much present in Springfield Woods are the cultural and economic history of the site, which is in Wilson Park, a neighborhood established as one of Baltimore’s first African- American “suburbs.” Nohe and Baker are researching this history, as well as working with the Maryland Historical Society to unearth Springfield Woods’ industrial past, as part of their initiative. They are also engaging with the community group Friends of Springfield Woods to determine how local residents can get the most out of the project. The focus of his efforts may be a tiny spot on the map, but Nohe sees in it the start of something big – a “test case” for how people can think differently about urban forests as small as Springfield Woods and as vast as Leakin Park.